girdle to formally launch the new Brigid's Way pilgrimage in Kildare Heritage Centre. 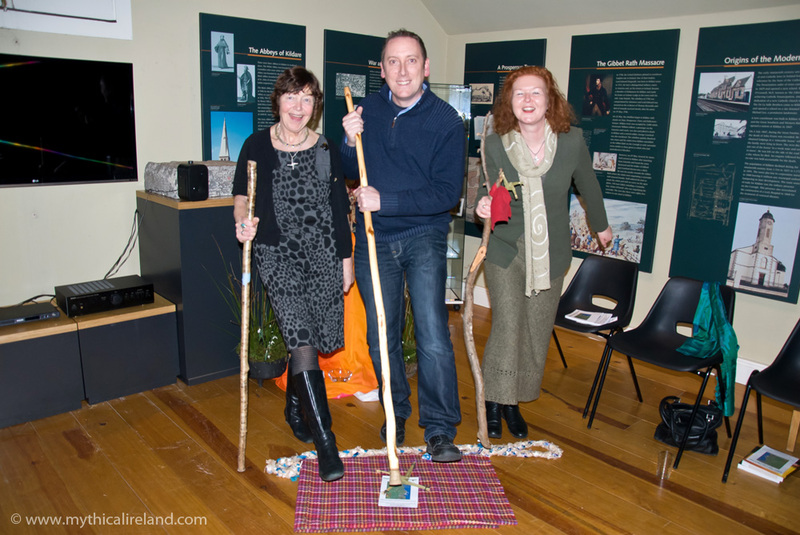 The new Brigid's Way Celtic Pilgrimage was formally launched in Kildare town, the place most famously associated with her, in an interesting and moving ceremony. 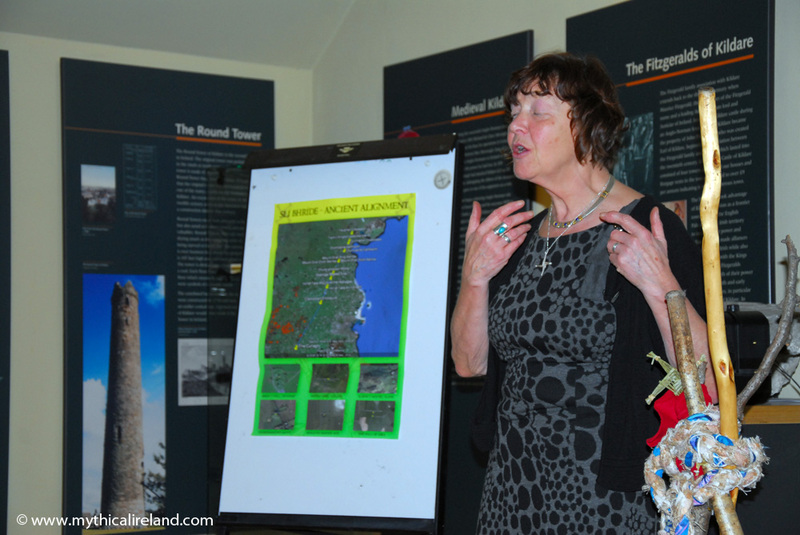 The launch was held in the Kildare Heritage Centre. I spoke about how the alignment was originally discovered, not long after Richard Moore and I began our researches in 1999, and added how its span was later extended when I was working on the second edition of Island of the Setting Sun in 2008. The alignment stretches from St. Brigid's Well in Faughart, the place of her birth, and passes through monuments on Mount Oriel, the Hill of Slane, Realtoge Hill, Hill of Tara and several other prominent sites, before reaching The Curragh in Kildare, another place strongly associated with Brigid. Ever New' speaking at the Kildare launch. 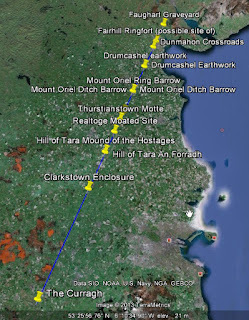 Dolores Whelan spoke about how herself and Karen Ward had hooked up and decided to investigate this alignment to see if it could be walked as a pilgrimage route. 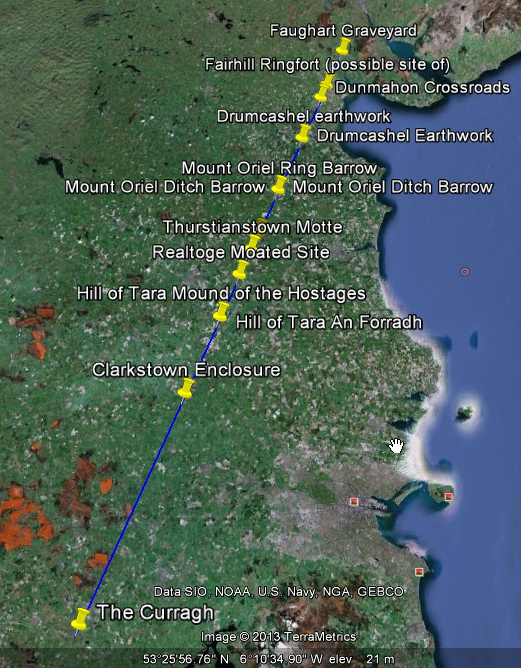 While on Sally Cox's land in Dundalk, she told them that the original Slí Bhríde, an old pilgrim route from Faughart to Kildare, had passed through her land. They were astonished, because they did not know there had been an original Slí Bhríde. Karen Ward spoke of some of the synchronicities that had taken place during their investigation of the route, including a link that all three (Dolores, Anthony and Karen) have with shoe shops or shoe factories in Dundalk. To formally launch the new pilgrim route, all three stepped over a Brigid's crois and ceremonially took the first steps along the new route (photo above). 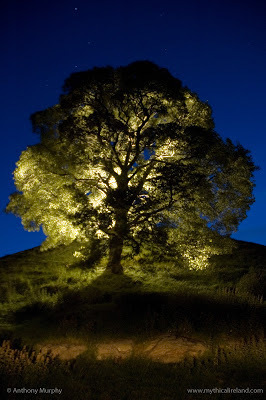 Dowth and its sycamore tree like you've never seen them! The huge sycamore tree growing out of the side of Dowth mound is one of its endearing aspects in my opinion. Dowth is now the only one of the three great mounds (Newgrange and Knowth are the others) that has not been "spoiled" by a modern redecoration. One of my favourite aspects of photography is a technique called "painting with light", and I can often be found in the countryside firing flashes and illuminating torches at monuments and other features. Of course, one of the challenges of the techniques used above is that one has to operate the camera - and one also has to illuminate the subject. 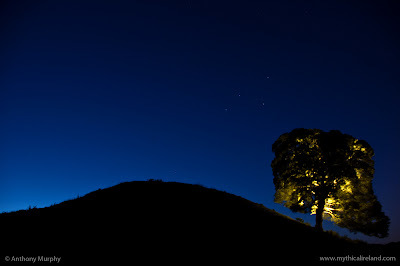 In the first and second images, the camera fired while I was remote from it, shining a torch up at the tree. Thankfully on this occasion I had the assistance of my good friend, Richard Moore. A couple of photos from the archives. These were taken in summer 2006 at Termonfeckin beach, where me and the kids decided to construct a miniature Newgrange out of stones available at hand. I would have been in the middle of writing 'Island of the Setting Sun' at that time. Can't believe that's nearly seven years ago already . 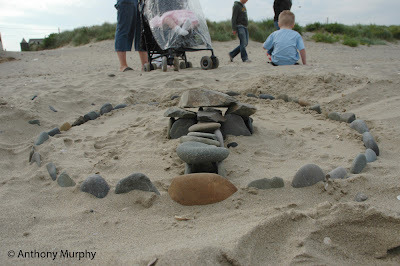 . .
Labels: beach, kids, miniature, model, Newgrange, sand, stones, Termonfeckin. I have started on my next book. Actually, I started before Christmas, but put it to one side to allow the madness of Christmas and the excitement of solstice pass. I've no idea what it's going to be called yet, but what I can tell you is that it will be a collection of Irish myths explained in such a way as to make them relevant to the modern world and our current situation (as much as possible). I don't believe there's any point in merely continuing to tell the stories - as so many books and websites are doing so diligently and laudably. It is clear - and this is something I touched on quite a bit in the Newgrange book - that people are seeking to reconnect with ancient wisdom and roots. This new book aims to assist them in that task. Our myths are not mere stories, simple fireside entertainment. They venture into the depths of the human spirit, and represent aspects of ourselves and our humanity, and, in some ways, our flaws and failings as well as our genius and our brilliance. I believe that, in looking at the stories of the distant yesteryear, we can rekindle the ancestral aspect of ourselves that makes us uniquely who we are as a people, as well as reinvigorating our own inner spirits for the challenges of a frenetic and challenging 21st Century world. 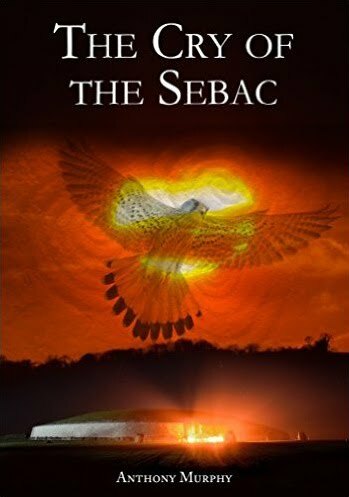 This book will be about bringing the Tuatha Dé Danann out of the sídhe and allowing them to become relevant to a modern Irish man and woman who have lost touch with earth and roots and cosmos. The late John Moriarty believed that we could reconstitute ourselves as a people by working from within our tradition. I agree with him. We are adrift, but we are not hopelessly lost. The fire in the head in each of us never burnt out . . . the emergence of the Tuatha Dé from the sídhe is symbolic of our return from a state of dormancy to a state of invigoration. We can stoke the ashes of the sacred fires of antiquity, and call upon the restorative powers of Diancecht, and the regenerative aspects of Bóann and Brigid, and the heroic aspects of Nuadu and Lugh and Cúchulainn and Finn to help us to become who we were supposed to be. We have a proud tradition. We have survived the invasions, the incursions, the gabála (takings). We are the same as the people who built Newgrange. They built it not only as an everlasting testament to their time, but also as an eternal reminder of the unvanquishable nature of our immortal spirits. Out of the obscurity of prehistory, a light has emerged . . .
Labels: book, folklore, Ireland, Irish, legend, myth, mythology, Tuatha Dé Danann. For all us stone-mad megalithomaniacs and anyone interested in ancient Irish mythology and cosmology, the name Jack Roberts is a famous one. Jack was a member of Martin Brennan's research team, known as 'Stonelight', who made significant discoveries in Ireland during the 1980s and who helped in the preparation of his books, in particular the seminal 'The Stars and the Stones' (later republished as The Stones of Time and still selling after all these years). 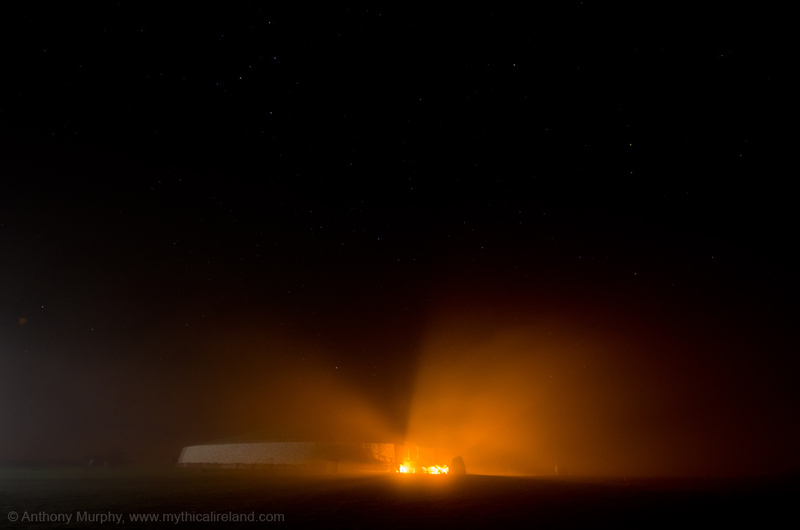 in over 25 years at the Newgrange Lodge, December 2009. Well, I had the pleasure of being properly introduced to Jack at winter solstice 2009, when I brought Martin Brennan back to Ireland for the first time in over a quarter of a century as the headline speaker at a conference called The Boyne Valley Revision. Jack Roberts was with Martin when, on the equinox in 1980, they rediscovered the alignment of Cairn T towards the sunrise on that morning. 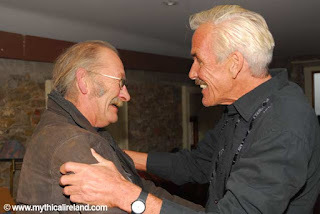 I can remember the day in December 2009 when Martin met his old friends, Jack Roberts and Toby Hall, in the Newgrange Lodge, where he was staying in advance of the conference which was taking place there. The warmth and the joy of the occasion was very moving. Toby Hall was moved to tears to see his old friend again, and Jack was equally thrilled. The highlight of my morning journey however was that I picked up a copy of your book 'Newgrange' and reading it has cast a beautiful spell over the solstice / xmas for me. Thank you for this work. It is an extraordinarily good synthesis of the story/history and relevance of our wonderful treasure. And I am not saying that because you placed Brennan's work in its true light but for the whole way you have placed Newgrange in its context of the present world. I have of course been extolling its virtues to all and sundry and will continue to so do. All best wishes to you and your family for the new year and thanks again for creating such a superb book. Thank you so much, Jack, for these kind words. I am moved. I really am. I am grateful that people like you, and Martin Brennan, and Toby Hall and the other members of your gang helped to unlock so many of the secrets of the Boyne Valley sites and indeed the other megalithic remains around Ireland. 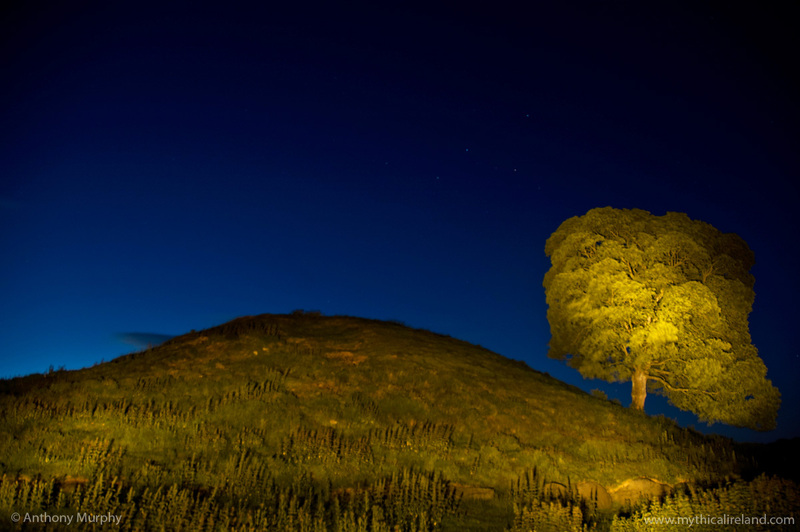 The tumulus at New Grange is the largest of a group of three at Dowth, New Grange, and Knowth, County Meath, on the banks of the Boyne in the plain known to Irish tales as Brug na Boinne, the traditional burial-place of the Tuatha Dé Danann and the Kings of Tara. 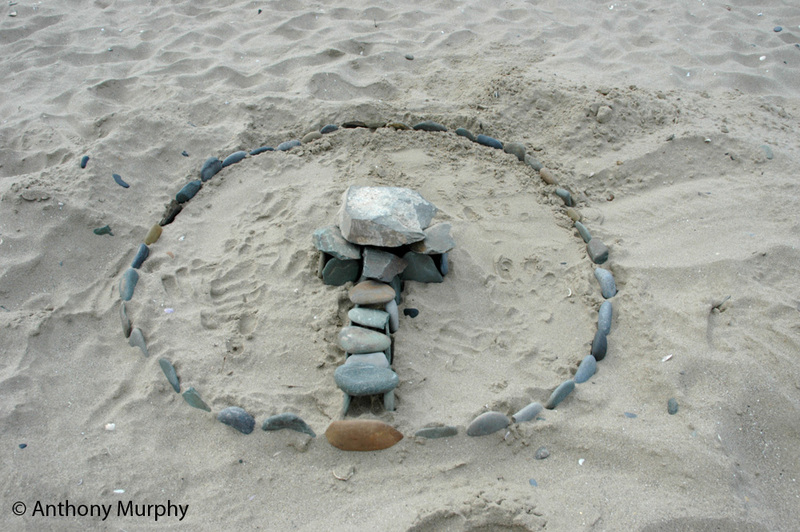 It was also associated with the Tuatha Dé Danann as their immortal dwelling-place, e.g. of Oengus of the Brug . 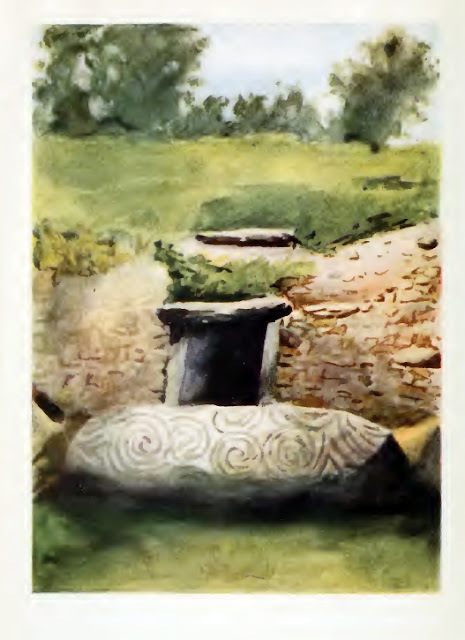 . .
At the time this painting was made, Newgrange had not been excavated (the archaeology would begin in the 1960s). As you can see, the roofbox above the entrance is blocked up and grass is growing from it. There are trees atop the mound, and back in those days it had a very natural, although somewhat forlorn, appearance. 'What counsel do you give this lad?' asked Midhir. 'I have this for him' replied Eochaid 'On the day of the Samhain let him go into the Brugh and let him go armed. That is a day of peace and amity among the men of Ireland, on which none is at enmity with his fellow. 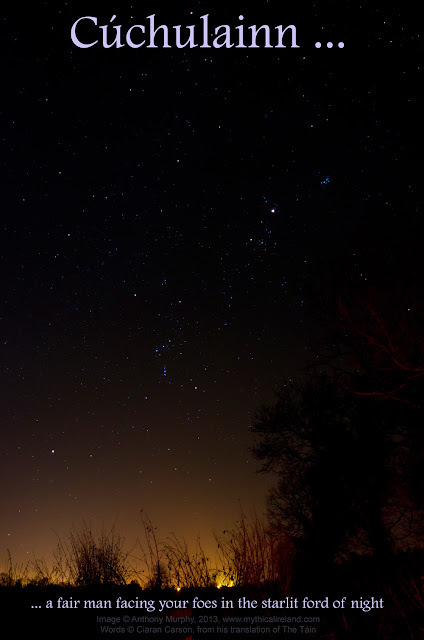 And Elcmar will be at Cnoc Síd in Broga unarmed save for a fork of white hazel in his hand, his cloak folded about him, and a gold brooch in his cloak, and three fifties playing before him in the playing field; and let Aengus go to him and threaten to kill him. But it is important that he does not kill him provided Elcmar promises him his will. And let this be the will of Aengus, that he be king a day and a night in the Brugh; and see that he yields not the land again to Elcmar until he submit himself to my decision. And when he comes let Aengus plea that the land has fallen to him in simple payment for the sparing of Elcmar's life, and that what he has asked for is kingship for a day and a night, and it is in days and nights that the world is spanned. That constant refusal of the Irish to fall in with the rapid torrent of European thought and progress, as it is called, is the strangest phenomenon in their history, and gives them at first an outlandish look, which many have not hesitated to call barbarism. We hope thoroughly to vindicate their character from such a foul aspersion, and to show this phenomenon as the secret cause of their final success, which is now all but secured; . . . there is no doubt that the Irish is the most ancient nationality of Western Europe; and although, as in the case of the Chinese, the advantage of going up to the very cradle of mankind is not sufficient to impart interest to frigid annals, when that prerogative is united to a vivid life and an exuberant individuality, nothing contributes more to render a nation worthy of study than hoariness of age, and its derivation from a certain and definite primitive stock. 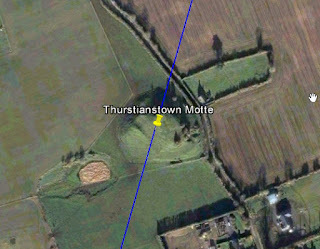 Above is a short video showing how I put together the new Boyne Valley Ancient Sites Interactive Map for Mythical Ireland. I quickly show how the map was compiled layer by layer, with different features being added along the way. The map is fully interactive - you hover over each site or feature with your mouse and a text box pops up explaining what that particular monument or feature is. A lot of the sites are also clickable, leading to further content. The new map features lots of newly-discovered monuments and landscape features, including a large raised routeway running from Dowth towards Site Q, the Dowth Henge, and the Dowth cursus which runs away from Dowth passage-tomb towards Ballyboy Lake. The huge range of sites in the valley featured on the map include passage-tombs, mounds, barrows, possible passage-tombs, embanked enclosures, ringforts, earthworks, standing stones, ritual ponds, a destroyed stone circle, and more.